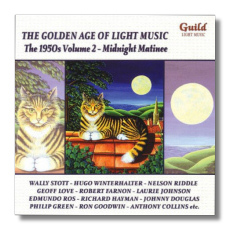 Classical Net Review - The Golden Age of Light Music - The 1950's Volume 2 "Midnight Matinee"
This is another lovely collection of music coming from the vast archives of the British Light Music realm. Once again, Guild continues to put us in their debt with these wonderfully planned reissues full of the most wonderful pieces and with the splendid annotation by the indefatigable David Ades. I have little to add to what other reviewers and my own writings have contributed to these oft recorded pieces. There are so many gems in these 76 minutes that one almost loses track of the individual items but begins hearing them as a palette of beautiful colours. Most notable amongst these pieces, one can single out Robert Farnon's 'Midnight Matinee', Anthony Collins' 'With Emma to Town' and Trevor Duncan's 'Panoramic Splendour'. The orchestras are also excellent with some of the finest names of the 50's making their appearances. Amongst these we have Philip Green and the Cameo Players, Richard Hayman, Wally Stott and the legendary Hugo Winterhalter. I've already mentioned the excellent notes by David Ades which truly form an integral part of this wonderful series. At this price, this is definitely an essential recommendation to all lovers of light music.